It is highly unusual to come across someone who has never experienced fleas on a pet. These pests are very well adapted in their parasitic ways, causing much irritation as they live and feed upon the family cat or dog. Anyone who has lived in a home under attack from fleas will wonder whether these bloodsuckers are partial to humans too. There are many horror stories and myths which circulate regarding fleas on humans. If you start to itch just reading about them, the sight of a flea in your home may send you running for the hills. But do you really need to worry? In this article, we will tell you all you need to know about fleas on humans. Can Fleas Live on Human Blood? Can Fleas Transmit Disease to Humans? Fleas are not fussy about where they find a source of blood upon which to feed. If fleas are in a habitat which is shared by people, they will not hesitate to bite and feed upon them if necessary. Most of the time though, humans are an opportunistic feed. Fleas would much rather bite their preferred hosts, which are furry mammals such as your family’s pet. Regarding where fleas will bite you, they most often settle and feed upon the lower body, usually the ankles. They are able to feed anywhere there is bare skin, but they simply cannot normally reach much higher than this. Once they’ve landed, they will tend to start feeding right away, without wandering about. For this reason, you’re less likely to feel a flea upon your body, as they remain very still. It is very unusual to find flea bites above the knee. Fleas are known for being skilled jumpers, but they are not able to jump this high. The only circumstances in which you may be bitten by a flea in these areas is if you are sitting or lying on the floor. Due to the fact that fleas tend to bite people and then leave, it can be difficult to ascertain whether you’re being bitten by fleas or another pest. Flea bites feel like a short, sharp sting, or a pinch. Because fleas are so small, even if you were to look down at your ankles, it is unlikely that you would spot them right away. The best way to tell if you are being bitten by fleas is to undertake some detective work. This means you have to examine your home and any pets thoroughly for any signs of fleas. These parasites are most at home in damp, dark, warm and sheltered places. The base of carpets, any cracks in the floor, or between baseboards are prime locations for fleas in their pre-adult stages to hide. Flea eggs look like tiny grains of rice or salt, while larvae are very small worms. These will develop in their hiding place until they are ready to emerge from their pupae cocoon as an adult flea. The first thing they will do is jump onto a passing warm-blooded creature for a meal. Because flea eggs are so tiny, you would need a magnifying glass and a flashlight to see them deep in the carpet. You will have to get up close and part the fibers to spot them. If your carpets are light colored, this may be a fruitless operation. In that case, the “sock method” is a good alternative. Put on a pair of white socks, pull them up over your ankles, and go for a stomp about your home. It is more effective if you really shuffle and stamp in the dense carpets. Walk close to the edges of the floor where it meets the baseboards. Once you have done a round of the home, take a close look at your socks. Live fleas may be visible clinging onto the fabric. If not, you could have “flea dirt,” tiny specks like black pepper, on the soles of your socks. This is flea excrement. Either way, these signs mean you definitely have a flea problem. The next step is to check your pet. Of course, the most common sign is intensive chewing and scratching. Sometimes they will also rub themselves up against furniture in order to try and reach the itch. Even if you haven’t noticed any bites on your own body, if your pet is behaving in this way, you must examine them. An effective method is to get a finely toothed comb, or a special flea comb, and go through their fur. The best spots are the back of the neck and base of the tail. Fleas and any eggs or dirt will get trapped among the teeth of the comb and pulled off the fur. You should be able to clearly see fleas and dirt if your pet has light fur. If they have dark fur, look out for “dandruff,” which on closer inspection could be flea eggs. You can also get a plain sheet of paper and tap the comb onto it, to see what falls out. If you suspect your pet has fleas, you must get them treated as soon as you can. Talk to your vet or local pet store to make sure you’re buying the right treatment for them. Many flea products are not suitable for all ages and types of animals. Dog products can poison cats, and vice versa. Kittens and puppies can also get toxic shock from some treatments, as their body mass is too low. 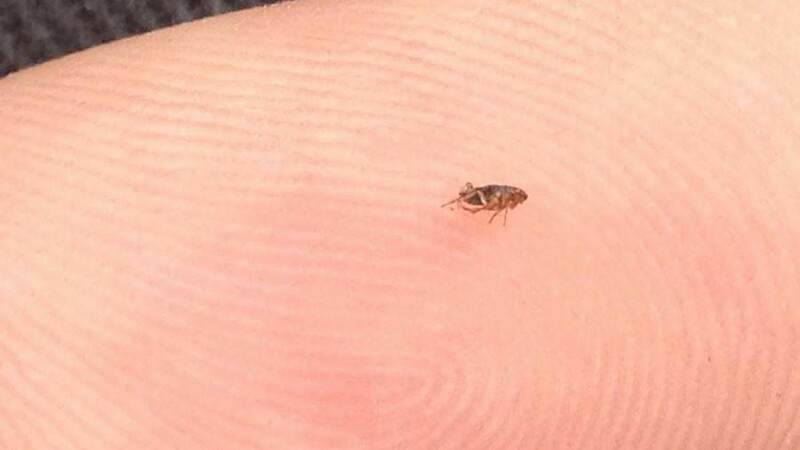 In the moments after being bitten, a flea bite will appear as a small area of swollen and raised skin. Over the course of the next 24 hours, this swollen area starts to look like a tiny welt. Bites will generally have a red “halo” around them, which encircles the bite. Fleas often bite multiple times before leaving; so you may have several bites in one small area. Not everyone reacts in the same way to flea bites. Some people may experience a more intense reaction than others. This is entirely dependent upon that person's sensitivity to skin irritations. If you have been exposed to flea bites for a period of time, you may find your reactivity to flea bites starts to diminish. Whether you react heavily or not, the body’s response to a flea bite tends to build over time. It’s not the same as a wasp or bee sting, where the results are apparent immediately. Young children often have an even longer development period before the bite becomes apparent. The first thing that a flea does when it lands on bare skin, is to try and locate a blood vessel to feed from. This is known as exploratory probing. They will pierce the skin with their specialized mouthparts in multiple places until they find a suitable spot. This is why you see numerous bites in a small area. When the flea is satisfied with the location, they will secrete saliva into the wound. This saliva has distinctive anticoagulant properties which keep the blood from clotting. It is the chemicals in their saliva which produce the irritation and swelling on the skin after they have left. Fleas will stay and feed upon humans for up to 25 minutes at a time if they are not disturbed. The site of their bite will start to become raised after around 30 minutes have passed. Capillaries around the bite location will dilate, causing the area around it to become reddish in color. It can be difficult to see exactly where the flea bit you, as the swelling is not a uniform circle around the bite site. This initial swelling is generally about 0.07 inches to 0.3 inches in size at its widest. Sometimes, if you have had a more intense reaction, the red area can be as wide as 0.7 inches from the center of the bite. Any swelling continues to increase for a few hours after the bite took place, but it is usually gone after 12 hours have passed. The mark left behind is a small red dot, which isn’t often recognized by the victim until the irritation begins. In some cases, absent-minded itching will break the skin open, leaving a hole which some people believe was caused by the initial bite. It’s common to mistake flea bites for mosquito bites and vice versa. Bites from mosquitoes tend to appear more fluffy than flea bites. They look like they are filled with fluid and are soft to touch. Of course, this is a generalization, as different people react differently to insect bites. If you have noticed bites on your body and you’ve been outside during dawn or dusk, they could be mosquito bites. Another defining feature is that mosquito bites will be-be spread across many different areas of your body. If your bites are located in the middle of a rash and are in straight lines, these could be bed bug bites. You should keep the flea bites clean and try your best not to scratch them. If the skin is broken, the risk of infection becomes much higher. Infected bites will take much longer to fully heal and, when they do, they usually leave a scar. You will know if a flea bite is infected because it will become filled with pus and start to look like a small boil. The bite will be very painful and the surrounding skin may also be warm to the touch. If this happens, you should see a doctor to avoid complications. Flea bites usually only last for a few days before fading away. If you have had a strong reaction to the bite, it may take a week or more to completely vanish. In very rare instances, there have been reports of people still showing marks from flea bites over a year later. The most common flea in US households is the cat flea. Despite their name, these fleas will live on many warm-blooded furry mammals. Cat fleas are capable of surviving on a diet which consists only of human blood. Studies have shown that fleas will live for as long as 185 days if they are only allowed to feed on a human arm for 15 minutes once a day. Fleas are able to produce some eggs when feeding upon human blood, but at a greatly reduced rate than when they are feeding upon their preferred host. They must also feed upon humans for much longer periods of time to be fertile enough to produce eggs. While it is possible, the number of eggs laid when feeding on people is much fewer. Cat fleas can only produce 3 or 4 eggs per day when feeding exclusively upon people. Usually, they would be able to produce as many as 30 eggs, if they’re feeding upon a cat or dog. Outside of the lab, while fleas will happily bite humans on occasion, they do not tend to breed and live on people. They will instead bite, feed and then leave. Fleas are not designed to remain on humans, they are specialized creatures which have evolved to live on furry hosts. Because of this, they find humans quite hard to attach to, and they don’t like being left exposed on a relatively hairless animal like us. A flea will usually remain upon a human and feed for between four and seven minutes if undisturbed. They will often bite and feed two or three times before leaping away. In order to breed, a flea must stay upon a source of blood continuously. They are not able to waste precious energy hopping on and off a person if they are producing eggs. Even if they did, a few minutes here and there is not enough blood to sustain fertility. Therefore, if you have a pet in the home, they will be the main target of fleas. If you are without pets, fleas can survive by feeding upon you alone. But they will not be able to multiply at the same rate and the majority will likely starve. You may wish to keep fleas away from babies and children by keeping infested pets at a distance if you don't want them becoming a flea target throughout the day or night. A common concern about flea bites is whether or not they can transmit diseases to humans. Fleas do carry disease, but the chances of getting sick from a flea bite in the US is low. That said, let’s have a look at some of the diseases which can be transmitted by fleas. Fleas are infamous for the role they played in the Black Death during the Middle Ages. This plague wiped out millions of people and was caused by infected rat fleas biting humans. Even now, fleas can still host the bacteria which caused the plague. Cats are at risk of contracting the plague from eating rodents which are infected. The fleas which reside upon the cat will also catch the disease from feeding on the cat’s blood. If these infected fleas then bite humans, they can pass the bacteria and the infection on. Luckily, plague is rare in developed countries like the US. The last major incidence of plague in the US happened in 1925. This disease is caused by a bacteria which is carried from infected fleas to mammals, such as cats and humans. The bite of the flea can transmit this disease, as can physical contact with flea droppings. Symptoms of this infection can include: vomiting, nausea, stomach cramps, and a high fever which can continue for more than seven days. Murine Typhus is usually seen in the states of Texas and California in the summer months. Cat scratch disease is a form of bacterial disease which is transmitted between cats by fleas. If a person has a condition resulting in a weak immune system, they are much more at risk of contracting this disease. It is thought that around 40 percent of cats will be carrying this disease for at least some time during their lives. It doesn’t make cats themselves sick, but can be transmitted to people by way of infected flea feces in the fur, or on the cat’s claws or teeth. Common symptoms include: bumps or blisters at the site of scratch/bite, fatigue, headaches, body aches, swollen lymph nodes, and fever. Parasitic tapeworms can be transmitted to humans if the infected fleas are accidentally ingested. The symptoms of tapeworms can be quite similar to those of other diseases. If infected, the victim will present with weight loss, nausea, lack of appetite, diarrhea, and general weakness. To eliminate tapeworms, multiple courses of medication are usually required. Luckily, contracting tapeworms from fleas is quite difficult and therefore rare. Flea bites will not transmit tapeworms, a flea must be swallowed to bring the tapeworm into the digestive tract. The most likely victims are young children, who tend to be less fussy about what they put in their mouth. As we have seen, it is unusual for fleas to spend a great deal of time on humans. Fleas prefer to feed upon us and then leave. But in the absence of a preferred host, fleas may spend more time on humans. If you’re experiencing many flea bites, you must level up your personal hygiene, as well as treating your home and pets. If you do not have pets, fleas may settle in very thick hair or beards, initially believing you are a suitable host. Once they have fed, they will recognize you are not a preferred host with nutritious blood, so they will wish to leave. However, there may be some cases where they cannot find their way out of the hair right away, remaining there for a few hours or even days. Ensure hair and beards are thoroughly combed through. Use a finely toothed flea or lice comb if you can. There are many medicated and strong smelling shampoos on the market which are great for repelling fleas from hair. Shaving beards and pulling loose hair tight to the head will help prevent fleas from getting trapped in your hair. When removing fleas from yourself, any pets in the home must be treated right away. The majority of the adult flea population will certainly be present on your cat or dog, so eliminating them from their coat is a very effective way to halt further breeding. Now that fleas are removed from you and your pet, you should start to treat your home. If you stop now, all those flea eggs, larvae and pupae in your carpet will develop into more adult fleas and you will be back where you started. By far the best way to get rid of fleas in the carpet is vacuuming intensely. Adult fleas, eggs, and larvae will be sucked up and destroyed by the vacuum. Flea pupae are a little more difficult to remove on the first try. Their cocoons are firmly attached to the carpet fibers while they develop into adults. However, the vibrations from your vacuum cleaner will stimulate those pupae which are ready to emerge into hatching. They will believe that these vibrations are coming from the movements of hosts on the carpet above, climbing to the top of the fibers where they are immediately consumed by the vacuum. Using diatomaceous earth alongside vacuuming is an even more powerful option. Diatomaceous earth dehydrates and desecrates fleas, quickly killing them. You must use “food grade” diatomaceous earth. The other kinds are chemically treated and not suitable for use in the home. Sprinkle the diatomaceous earth on the carpet and brush into the fibers with a broom or any other stiff bristled brush. Leave the earth in the carpet for a day or two, then vacuum thoroughly. All soft furnishing covers, pet bedding, human bedding and pet toys must be washed on a very hot cycle to kill any fleas or eggs that may be hiding. The undersides of furniture should be vacuumed too just in case some fleas have tucked themselves in here. Flea traps can be made and placed in certain hot-spots around the house to reduce numbers. For complete and virtually guaranteed elimination without using a pest control service, a steam cleaner is your best option. Fleas are unable to survive any temperatures higher than 95 degrees, so a steam cleaner will certainly wipe them out. There are a number of ways to prevent being bitten by fleas, so you do not have to suffer the irritation caused by their presence while you battle them. Flea repellents work by making the immediate environment upon your skin very unfavorable for fleas. They are irritated and repelled by some very strong smells and tastes, causing them to leave and remain at bay. There are both chemical and natural options available when choosing a flea repellent. Both of these are effective, but the chemical options tend to last longer between applications. Chemical flea repellents will almost always contain some concentration of DEET, or “N,N-Diethyl-meta-Toluamide.” This repellent is capable of discouraging many different types of biting insects, most notably mosquitoes. In fact, DEET was originally developed as a mosquito repellent by the US Army, to prevent soldiers operating in tropical regions from contracting mosquito-borne disease. Due to its effectiveness, DEET is a very popular insect repellent. It’s found in almost all commercially available repellents in some concentration or another. It can be purchased as spray, wipes, lotion, roll-on or gel, and is suitable for use on clothing as well as skin. Chemical-free repellents are also available to buy or make at home. Strong-smelling essential oils like eucalyptus and citronella are commonly used, as are vinegars and herbal extracts. If you’re making your own repellent, it is wise to research toxicity risks to animals in the home, and dilute the solution well before applying to the skin. If you don’t have immediate access to a repellent, protective clothing is an effective way to ward off flea bites in the meantime. Fleas are not able to bite through clothing, unless it is very thin and figure-hugging, like pantyhose. Tucking long trousers or jeans into your socks should adequately protect your ankles and lower body from bites. Long-sleeved shirts tucked into your waistband will prevent fleas crawling underneath your shirt and biting you if you are sitting close to the ground. This is important because fleas will do their best to reach your skin, actively seeking a way under clothing, where they are sheltered and hidden from the light. With this in mind, it’s no surprise to learn that fleas will tuck themselves into the seams of clothing. They can more easily attach themselves to clothing fibers, hitching a lift from one place to another while they wait to take a bite. For this reason, it is imperative that all clothing is washed on a hot cycle after wear if you’ve been in the presence of fleas. It’s no secret that fleas are an unwelcome and unpleasant addition to any home. They will make all residents itch with their nasty bites, and cause much embarrassment if you have any visitors. While fleas are much more interested in feeding upon any unlucky furry animals in the vicinity, humans can be on the menu too. Luckily for us though, in the vast majority of cases, they do not like us enough to want to stay on our bodies. This knowledge should come as a small consolation for those who are currently battling a flea infestation. Hopefully, the information provided in this article will put the mind at rest regarding the potential for fleas living on humans.